You know that friend who's always trying to mooch off you? That person who usually comes around only when they want something from you? You can probably think of someone. If you come through for them, if you give them what they want, then they're happy with you. If you don't come through for them, if you don't give them what they want, then they're upset with you. I bet you know someone like that. "Oh, now we're on God's good side. Whoops, now we're on his bad side. Oh, we better do something to make up for that." Up and down, 'round and 'round we go. That kind of roller coaster ride might be fun at the amusement park, but it's no fun in the thing that matters most, namely, your relationship with God. Fortunately, that's not who God is, and that's not how God relates to us. In Genesis 4, a guy named Cain kills his brother, Abel. In Genesis 6, everyone's desires have grown more and more evil. In Genesis 9, Noah - the hero of the flood - is shamed for passing out with no clothes on. In Genesis 11, people finally work together only to build a tower to heaven so they can stand back and say, "Look at how great we are!" If God was really like some of you think he is, if God was interested in a conditional contract, if God was only asking, "What can you do for me?, then God would have given up on us at this point. He would've said, "Whatever. They're never going to get it right. I'm out. We're done. We are never ever, ever getting back together." But God doesn't related to us with a conditional contract; God relates to us with an unconditional covenant. Old Testament scholars refer to Genesis 12:1-3 as the hinge or turning point of the Old Testament, and perhaps even the whole Bible. Here's why. 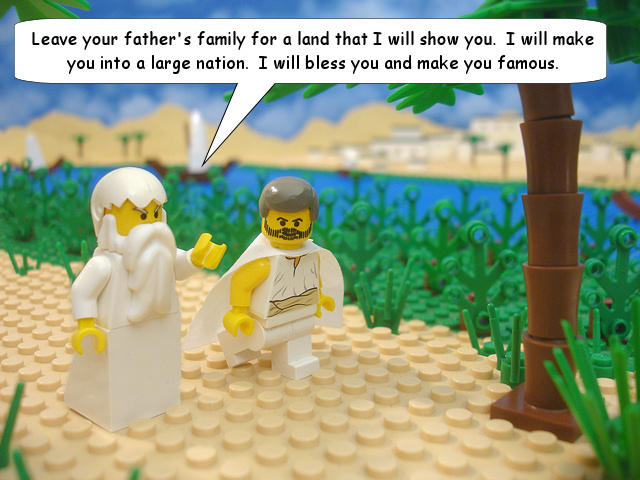 Genesis 12:1 says, "The LORD had said to Abram, 'Leave your country, your people and your father's household and go to the land I will show you.'" After all of the sin, after all the pride, after all the bad choices, God offers grace and a future for his people. He doesn't break it off; he offers a new start! Maybe you think you've blown it. Maybe you think there's no way that God could love you after what you've done. Or maybe it's not about what you've done. Maybe it's about what's been done to you. You need to know that now matter how bad things are for you, or no matter how bad things might get, God hasn't given up on you. God doesn't shut you out. He invites you in with a word of grace, and a promise for a future. But if that was all we knew of Abram's story, then we might be tempted to think that God just rewarded his good behavior: God said go, Abram did what he was told, and God rewarded him. But that's not all we know. Verses 2 and 3 go on with God telling Abram: "I will make you into a great nation and I will bless you; I will make your name great, and you will be a blessing. I will bless those who bless you, and whoever curses you I will curse; and all the peoples on the earth will blessed through you." Do you see who is performing the action in these verses? It's not Abram; it's God: I, I, I, I, I. Five times God says, "I will do this." It's not a conditional contract; it's an unconditional covenant. It's not something that Abram has to achieve; it's a promise that he has to believe. "Abram believed the LORD, and he credited it to him as righteousness" (Genesis 15:6). Abram didn't always get it right. He didn't always make the best choice. He wasn't perfect. 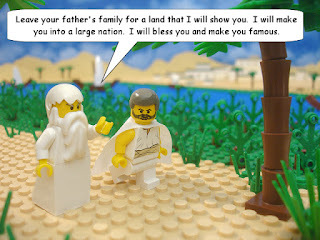 But God made him a promise, and Abram believed that God is who he says he is, and that he will do what he says he'll do. And because of that belief (or faith), Abram is declared "righteous," or "in the right" with God. God enters Abram's story, and he enters our story, not with a conditional contract based on your performance, but with an unconditional covenant based on his promise. It's not a list do's and don'ts; it's a relationship in which he says, "Come to me, believe in me, trust in me, put your faith in me."